“It’s a brand new story,” announce the commercials for Walt Disney Pictures’ newest family film, Winnie the Pooh. Indeed, it is. But thankfully familiar faces are back to tell it: Winnie the Pooh, Tigger, Piglet, Eeyore, Owl, Rabbit, Kanga, Roo and Christopher Robin. These are the characters who literally first lept off the page from A.A. Milne’s beloved children’s literary classics (Christopher Robin’s character is named after his very own son and Pooh and the other characters were inspired by his son’s stuffed animals) and onto the big screen in the original Disney featurettes: Winnie the Pooh and the Honey Tree (1964), Winnie the Pooh and the Blustery Day (1968) and Winnie the Pooh and Tigger Too (1974). Later, Walt Disney Animation Studios combined these together for a 1977 theatrical feature called The Many Adventures of Winnie the Pooh. Since that time, the self-described “bear of very little brain” and company have made appearances in straight-to-DVD productions, but it’s been over 35 years since the animals from Hundred Acre Wood have been on the big screen. With its hand-drawn art style inspired by illustrations and three stories from Milne’s books, Winnie the Pooh tells an updated story with timeless lessons for twenty-first century families. Not surprisingly, lovable Pooh is still looking for that next pot of “huny,” as he wakes up one morning with a tummy that’s rumbling and grumbling. With his trademark “oh, bother” expression as he goes off in search of that golden goodness, Pooh is soon sidetracked and joins the other animals in looking for Eeyore’s lost tail. Christopher Robin then announces a contest to find a new tail, and soon everyone is trying to improvise with what could possibly work as a tail for the notoriously downcast donkey: a balloon, a yo-yo, a cuckoo clock, a weather vane, an accordion and more. Pooh later finds a note from Christopher Robin that reads “Gone out. Busy. Back soon.” Except with Christopher Robin’s “creative” spelling, over-confident Owl misinterprets it as he announces that the young boy has been captured by a creature called a “Backson.” And thus the tension is set. Will the gang band together and help find their dear friend? What will the wild quest lead them to when they finally encounter the probably really scary “Backson”? And which one will be sent into the dark woods all alone? It’s a madcap adventure with miscommunication and expectations—both great and misguided—as friends try to help one another while sometimes hilariously missing the mark. But in the end there are lessons to be learned as relationships are strengthened, fears are faced head-on and, of course, some fun with words on the storybook’s pages is to be had. I spoke recently with Mark Henn, the Supervising Animator for the characters of Winnie the Pooh and Christopher Robin at Walt Disney Animation Studios, and asked him why Winnie the Pooh and the rest of his friends are still so fun to watch and learn from, for both big kids and small, these many years later. Describe the type of animation in Winnie the Pooh that’s different than what moviegoers may be seeing in other animated films in theaters right now. Well, an obvious difference is the fact that this is hand-drawn, what we call a traditional animated film where the animators and the artwork is all generated by hand. The animation is done with paper and pencil as opposed to a lot of the animated films today which are computer generated the way the artists are manipulating kind of a CG design that models characters with a computer—whereas I sit down and start with a blank piece of paper and a pencil and make the drawing of the particular character that I’m working on. Are there any differences between what’s going on visually in Winnie the Pooh of today as opposed to what we may have seen on-screen in the ‘60s and ‘70s? Well, in terms of technology certainly there are some of the tools that have changed that we use, arguably the less creative areas. You know they were animating with paper and pencil just as we did on this film today, but there’s certainly some tools that have changed. But the idea and the effect that we wanted was to look and build upon what was done in the past . . . and like yourself, you said, grew up watching these films at the theater and they’re beloved characters and films to us. 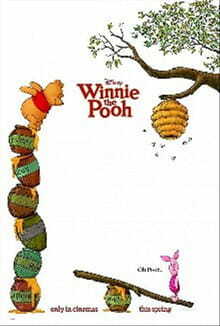 So we wanted to recapture the charm of the Hundred Acre Wood and the way that Disney created that world of Pooh. So you know that’s what we did. That was our goal. Do you feel that what we’re seeing in Winnie the Pooh is faithful to the illustrations of the actual books? Well, it’s faithful as much as what Disney has always done. It’s not exactly the way [E.H.] Sheperd drew Pooh. I mean if you put Disney’s version next to what Sheperd did there’s obvious differences. But then there’s a lot of similarities really. It’s surprising how much the characters actually do look a lot like Sheperd’s. I think some more than others. Pooh’s probably one of those that had a greater change than others, but Eeyore looks very much like the way Sheperd drew him. Piglet, Owl, I mean a lot of the characters are very similar. I used Sheperd’s work primarily as an inspiration in terms of I wanted to see the kind of poses and attitudes that he put Winnie the Pooh in and that was an inspiration to me as I was going through my animation to help come up with appropriate poses and attitudes that reflected the spirit of Shepherd’s illustrations but may not have looked exactly like them. Several of the filmmakers traveled to England to see the actual locations where Milne wrote the books and where the real Christopher Robin spent his summer vacations. Did you get to go? And why do you think it’s important that research like this was done? Well, I got to go but after the fact. We had a European press junket and that was held just a few miles from the Hundred Acre Wood, and so I went kind of after the fact. But what has happened now actually for many of our films, they do these research trips and it’s really important I think in terms of building a level of authenticity in our films that helps put across the believability. You know we don’t deal in realism in the sense that what you’re seeing is real, obviously, but it should be believable. And so the worlds that we try to create need to be authentic and believable and that comes from doing your research, doing your homework and that’s a very big part. And I’ve had the opportunity on other films to do a couple of those research trips and it does … to stand where Christopher Robin played and to see what he saw, you know it does give you a better idea. And there’s a lot of details and things that you know that the background painters, the layout artists, the story artists might learn on a trip like that and then they can bring back and it helps lay a foundation of authenticity that we can build on as the story develops and the artwork develops for a particular film. Would you speak to the live-action opening of Winnie the Pooh that shows Christopher Robin’s bedroom? Do you think it works seamlessly with the rest of the film? And what purpose do you think it serves for the audience? Well, you go back to what we did 35-40 years ago in the original films, and they all opened with a live-action opening as well. And so again we’re trying to build on what was done in the past, but as you see our live-action opening is vastly different than their original set. And it’s the same idea, you know. “This could be the room of any small boy, but it’s not. It happens to be the room of Christopher Robin.” They built, 35-40 years ago, they built kind of a generic little boy’s room and filled it with some stuffed toys and all that and that’s what they did. I don’t know how much research went into it, but I know for our film we all thought, “You know, we can do better than that.” And we actually had photographs of Christopher Robin’s room, the actual room, and the set that we used that was built has a more of an authentic look. Now it’s obviously been embellished for a richness for the film and you know maybe the color of the wall isn’t exactly what was in Christopher’s room. But the basic layout, the shape, the dormer window is pretty much exactly what you saw in the photos that we had of Christopher Robin’s room. So it serves in the same function; it just kind of sets the stage. And for us we end with the live-action room as part of the credits, so it kind of bookends for us. And I think for some people, it’s part of the magic. It was a real boy, he had real stuffed toys and you know this is kind of this make-believe world that he created with his friends, his friend Pooh Bear—Pooh for short—and I think that’s just part of the magic. Talk about some of the voices that give life to the characters. Do you think they were cast well? Well, of course, all of the original voice talent has passed on now. So Disney has used, for example, Jim Cummings has been Winnie the Pooh and Tigger’s voice for I think over 20 years now. He’s kind of been the standard for that. And I think the same with Travis [Oates] who did Piglet; I think he’s been the official Piglet voice. So Disney has a very good track record in terms of finding amazing sound-alike voices for a lot of their stable characters. Again, part of our bringing this new story to a new audience is we had that flexibility, not necessarily just the sound-alike, but the voice type that matches the character. So Craig Ferguson as Owl, I think is a wonderful choice. He really embraced that. And Eeyore’s voice was Bud Luckey. And what’s interesting there, he has a very naturally low voice. He was a story artist at Pixar and has retired, but he was available and he had done several voices before for Pixar films. But what’s really neat there is he was a story artist and the original voice for Eeyore, Ralph Wright I believe was his name, he was a story artist here at the studio as well. And that was his natural voice—this very slow, deep baritone-bass voice. And so we kind of thought it was a neat, almost an homage to the fact that they used a story artist for Eeyore’s voice and we’re using a story artist for Eeyore’s voice. So I really am very pleased with the voice casting, and you know we’ve always looked for just those right, sincere, just natural voices. Our director’s son, Don [Hall], his son was the voice of Roo. And it was just very natural, very charming. You can’t beat those kind of things. I know it’s billed as a “brand new story,” but inspired by the feel of the books. But it’s also said to have a “humor update.” For parents who may be mildly alarmed by that and think, “Oh great, does that mean potty humor?” what would you say to them? Well, you know that potty humor is easy. It’s cheap. And that’s one thing that I know that you know, yes, I suppose we’ve had some in some cases throughout our films. But by and large I think we really work hard to be better than that in terms of going for things that are genuinely funny and based on the character in the situation and not just go for the quick, easy potty humor line or noise or something. And I think that we just don’t have that in there. I mean we have a very well-written, witty story and it’s got the humor that grows from the characters in the situation and I think that’s what works the best. And I think that’s what resonates with not only kids but adults. It has those different levels for the different audiences. The film is building on what was done in the past, but it was done today. It’s a story for today, written today, produced, animated today. And the audiences I’ve seen it with were largely adults, and they love it. They really, really love it. I thought the part about finding Eeyore a tail was really cute. Is that a wink and a nudge to “pin the tail on the donkey”? Well, it really comes out of A.A. Milne’s book and a lot of the dialogue, a lot of the stories, come right from the original Milne stories. So, you can open up a book and actually read some of the same dialogue that we used in the movie that come from the story. What about the lesson at the end of the film? Instead of thinking of his tummy, Pooh thought of his friend first. It’s subtle, but it’s there. Absolutely. It’s not that we try not to hit people over the head or preach at them, but certainly there’s a nice positive message in there. And I think that a wise parent would be able to take advantage of that if the situation arises. And I think that that’s, you know, we like to see growth in characters throughout our story. Not that these characters make great changes, but Pooh is almost a honey addict. He does tend to think of himself sometimes more. But it’s just a very nice arc to the story that he, as Christopher Robin says, “It’s a very nice thing you did. You thought of others before you thought of yourself.” And I think what better message to have for a generation that seems to be all “me, me, me” these days. Piglet’s a good example of a character who undergoes a little growth, too. He’s anxious and fearful, but he presses on and rises to the occasion to help his friends. One of the animators, Bruce Smith who animated Piglet, kind of described Piglet as ”Pooh’s wingman.” That he’s his best friend, and he’s always there. Very loyal, very dependable which in a way you could say that about most of the characters. They’re a family that way. Why do you think that the characters and gentle lessons of Winnie the Pooh over the years are so timeless? Well, I think they’re just nice characters. I really think that they’re, despite their apparent dysfunctional-ities sometimes, like a family and ultimately they like each other. They love each other, and I think that there’s a timeless quality to that that I think we all are attracted to. They’re the kind of characters that you’d kind of like to hang out with. You can see Christopher Robin and his imagination and he enjoyed being out in the Hundred Acre Wood with them and confiding in them. So I think the way that they’re presented is that they’re very likeable and they’re very charming and whether you might be able to identify with a particular character or little bits of yourself may be in all of them at times. I think audiences if they have that ability to either connect to themselves or say, “I know somebody who acts just like Eeyore” or “I know an Eeyore in my life”—those kind of things make these characters live beyond just being an entertainment on the screen. I’d say, “Shame on you!” No [chuckles] … Well, you know there’s going to be an element of that because unfortunately that’s what happened to Pooh in the subsequent years since the last Tigger Too which came out in the early ‘70s. And it is unfortunate because he’s more sophisticated than that in a very sweet, charming way. I would hope somebody would tell somebody like that “You’re wrong, it’s very funny and it’s a really good movie and you should go see it.” And I think based on the few audience screenings that I sat in with and comments I’ve read online—one of my favorites was someone that said, “I’m going to that movie and I’m nineteen years old, and I don’t care what my friends say.” But you know whether you’re 22, 52, 82 or 2, it should appeal. I think you’ll find something for all ages. And that’s what we try to do. We try to make these films entertaining for all ages. Rated G and opening wide in theaters on Friday, July 15, 2011, Walt Disney Pictures' Winnie the Pooh features the voice talents of John Cleese, Jim Cummings, Craig Ferguson, Tom Kenny, Travis Oates, Bud Luckey, Jack Boulter, Kristen Anderson-Lopez, Wyatt Hall and Huell Howser. Zooey Deschanel sings an updated version of the “Winnie the Pooh” theme song, as well as other songs throughout the film, while the score is by composer Henry Jackman.